Check the table below to see a complete list of the sizes available. Some sizes have limited availability which means that once our supplier has run out, we can no longer supply that size. The smaller diameter sleaving comes in rolls up to 250m, while the larger sizes (20mm +) are supplied in rolls of 50m. Diameter is measured as ID (Internal Diameter). Thermal Products stock fibre glass sleaving, in 6mm, 8mm and 10mm, with sizes from 2mm through to 35mm available. We can also supply silcon coated fibre glass sleaving in various diameters. 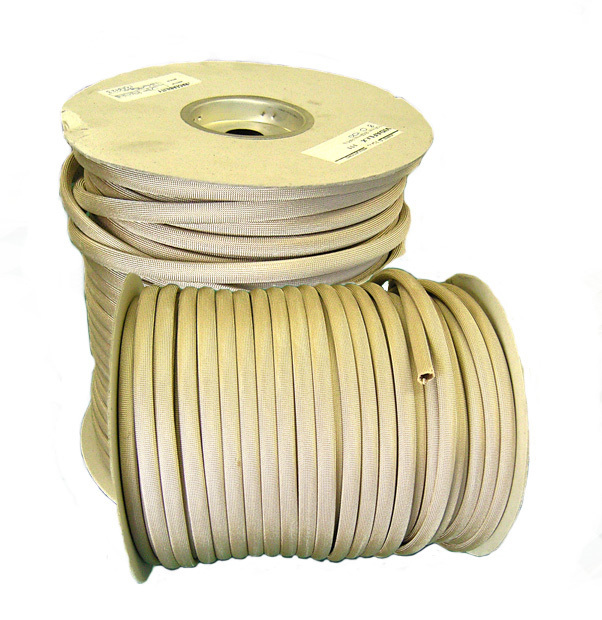 This product is used to insulate cables in high temperature environments. Rated to 260°C. It is limited in its ability to provide electrical insulation, which is why the silicon coated option is provided. Silicon coated fibre glass sleaving is not stocked.